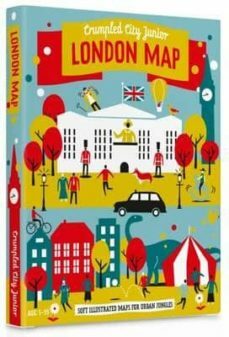 London Crumpled City Junior Map, not only printed on soft, very lightweight and yet extremely tear-resistant and 100% waterproof material but also presenting the city for the kids to enjoy: not just the British Museum or Tate Modern, but also Hamleys, Museum of Childhood, London IMAX, Rainforest Café and 28 other exciting attractions, all listed under the map with their addresses and websites. This Junior version and its counterpart proper Crumpled City street plan of Paris, are part a collection of very lightweight (approximately only 20g) street plans of major cities, specifically designed to be scrunched and crammed into pockets, handbags and backpacks. Creases are a fully intentional part of the quirkiness of the Crumpled City maps  the more battered they are they better they look.